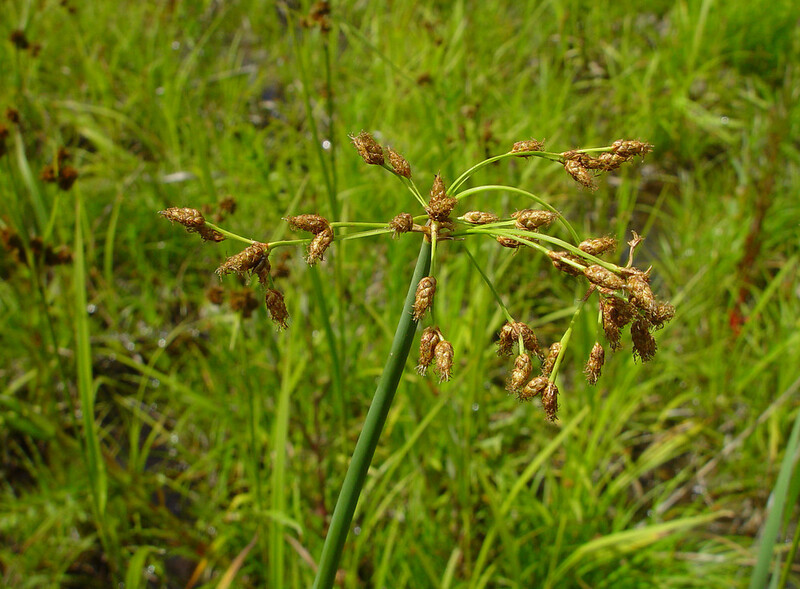 Schoenoplectus tabernaemontani. By Arthur Haines. Copyright © 2017.New England Wild Flower Society.gobotany.newenglandwild.org (Accessed 3/2017). Schoenoplectus tabernaemontani is a perennial C3 rush (Bryson and Carter 1977) 1-3 m tall, colonial from rhizomes, stems soft, easily crushed between fingers. Leaves few, mainly toward base, with well developed sheath, usually no blade. Flower spikelets oval, reddish-brown, 0.5-0.9 cm long, scales overlapping; Inflorescence to 6 cm, loose, often drooping, open, branching, bract erect, 2-10 cm like a continuation of stem above insertion of inflorescence; blooming and fruiting June-Sept.; fruit a dry nutlet (achene), probably water dispersed. Habitat: Open marshes, shallow water. Notes: Seeds eaten by waterfowl and songbirds, stems and rhizomes eaten by muskrats. Planted in wetland mitigations and restorations, soil pH 5.4-7.5, tolerant of fire, intolerant of shade, salt (USDA, NRCS 2010).